Welcome to the Land Hermit Crab Owners Society hermit crab adoption program! We are hoping this process will be a little more efficient for everyone. Our adoption program is open worldwide and we don’t exclude anyone simply for not being part of our Facebook group or a member of The Crabstreet Journal. However, we do encourage you to join so you have access to our care information and guidelines. We will also be able to assist you in an emergency. We will do our best to find an adopter close to you but there is no guarantee. Please note most adopters expect the adoption to be free. If possible, please email us a clear photo of the crab(s) to be adopted. This will be used on social media to help find adopters. Send to: hermitcrabadoptions@gmail.com with your name. Transport assistant – I am willing to drive to meet someone to pick up or deliver hermit crabs involved in an adoption or foster transaction. A minimum standard of care must be observed in order to be approved. We will work with you to improve anything that is not up to standard to help you get approved. We do require adopters to be at least 18 years old. Please use care and caution when arranging in person hand offs and make your own personal safety the top priority. A 20 gallon tank is the minimum size for adopters. This can house 2-3 SMALL hermit crabs. Totes may be used as TEMPORARY housing but we will not approve adopters who use totes as their permanent housing. 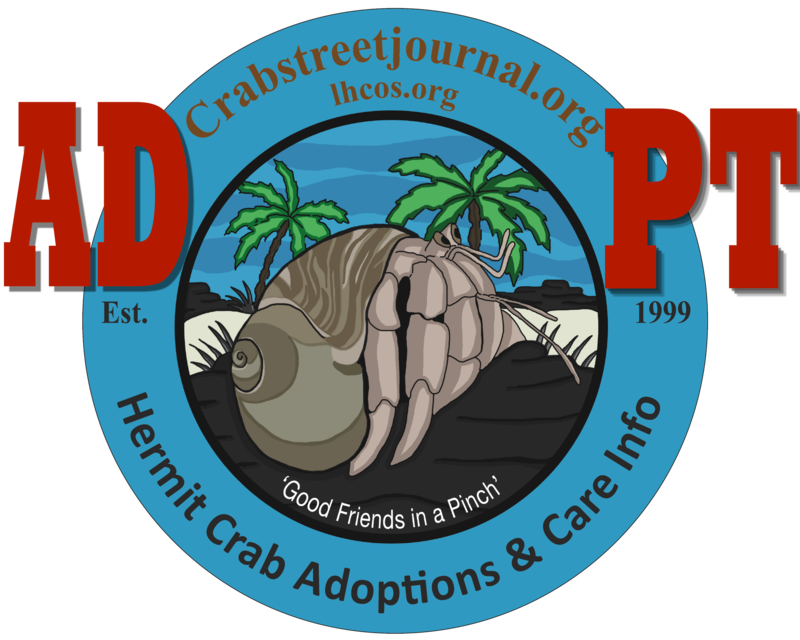 If you are on Facebook we have added a page for hermit crab adoptions (please like and share to help us reach more potential adopters).